Semtech Corporation (Nasdaq: SMTC), a leading supplier of analog and mixed-signal semiconductors, will feature its LoRa® Wireless RF Technology, wireless charging, smart sensing, smart switching, and other next-generation semiconductor platforms targeted at today’s fastest growing markets at CES 2017. Semtech’s platforms will be used in a number of consumer products demonstrated at the show, including Internet of Things (IoT) applications, wireless chargers and wireless charging-enabled devices, mobile devices, wearables, and tablets. LoRa® devices and gateway reference designs to be showcased in a virtual demonstration from myDevices, TEKTELIC Communications, GlobalSat, and other sensor companies in both Semtech and MyDevices’ private meeting suites. The LinkCharge™ wireless charging platform for low-, medium- and high-power devices to be demonstrated in Semtech’s private meeting suite, as well as on the show floor at the Infineon booth MP25265 and the AirFuel Alliance booth 41139. Semtech’s wireless charging experts will be at the AirFuel Alliance booth daily to demonstrate the technology. Smart human sensing solution for wearable applications to be featured in an interactive demonstration in Semtech’s private meeting suite. Breakthrough power management product demonstrations in Semtech’s private meeting suite allow customers to experience Semtech’s automotive LED backlighting products and other differentiated power management solutions, including the Neo-Iso™ isolated smart power relay replacements for home automation, connected buildings and IoT applications. 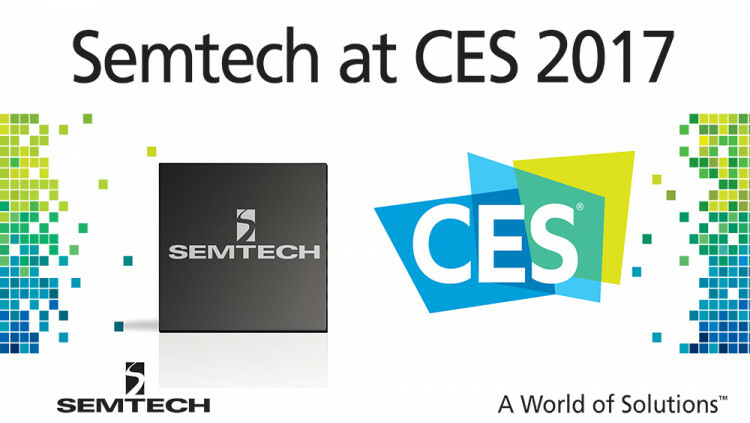 Email meetings@semtech.com to schedule an appointment with a Semtech representative at CES. For 50 years, CES has been the launch pad for new innovation and technology that has changed the world. Held in Las Vegas every year, it is the world’s gathering place for all who thrive on the business of consumer technologies and where next-generation innovations are introduced to the marketplace. The International Consumer Electronics Show (International CES) showcases more than 3,800 exhibiting companies, including manufacturers, developers and suppliers of consumer technology hardware, content, technology delivery systems and more; a conference program with more than 300 conference sessions and more than 165K attendees from 150 countries. For more information, visit www.ces.tech. All statements contained herein that are not statements of historical fact, including statements that use the words “enable,” “will,” “designed to,” or other similar words or expressions, that describe Semtech Corporation’s or its management’s future plans, objectives or goals are “forward-looking statements” and are made pursuant to the Safe-Harbor provisions of the Private Securities Litigation Reform Act of 1995, as amended. Such forward-looking statements involve known and unknown risks, uncertainties and other factors that could cause the actual results of Semtech Corporation to be materially different from the historical results and/or from any future results or outcomes expressed or implied by such forward-looking statements. Such factors are further addressed in Semtech Corporation’s annual and quarterly reports, and in other documents or reports, filed with the Securities and Exchange Commission (www.sec.gov) including, without limitation, information under the captions “Management’s Discussion and Analysis of Financial Condition and Results of Operations” and “Risk Factors.” Semtech Corporation assumes no obligation to update any forward-looking statements in order to reflect events or circumstances that may arise after the date of this release, except as required by law. Semtech, the Semtech logo, LoRa, LoRaWAN, LinkCharge, and Neo-Iso are registered trademarks or service marks of Semtech Corporation and/or its affiliates. Third-party trademarks or service marks mentioned herein are the property of their respective owners.